Another delay to the U.K.’s exit from the European Union risks keeping businesses and consumers on edge and hobbling the economy. Brexit is on course to be delayed until the end of October under a plan to avoid a chaotic no-deal hashed out over late-night talks in Brussels. The U.K. can leave earlier if Parliament ratifies Prime Minister Theresa May’s divorce deal. While the delay removes the immediate danger of a cliff edge for companies, it also prolongs uncertainty, with the flexible element of the extension only adding to the fog. Firms are bearing the scars of the last few months of turmoil and investment may remain subdued -- or worse -- until clarity is restored. Speaking on Thursday, Carolyn Fairbairn, director-general of the Confederation of British Industry, described meeting company owners who feel like they’re burning cash because of the costs of stockpiles and warehousing -- something she believes will not be alleviated by the extension. “It has been a real cost to the economy,” she said. In the U.K., investment intentions are already at their lowest level in eight years, and automakers Jaguar Land Rover, Honda and BMW had scheduled production shutdowns at U.K. plants to coincide with any potential Brexit disruption around March 29, the original Brexit deadline. The economy grew at the start of 2019, but there’s signs of a boost from stockpiling as firms built up inventories to record levels. That means the true state of the economy could be worse, and there’ll be a drag on growth as front loading of orders is unwound. Consumers, who saved less to keep spending following the referendum, may also be unlikely to come to the rescue this time round. Surveys show they have already started delaying big-ticket purchases amid the heightened uncertainty, despite enjoying faster wage growth. That could leave U.K growth looking even more anemic than forecast. 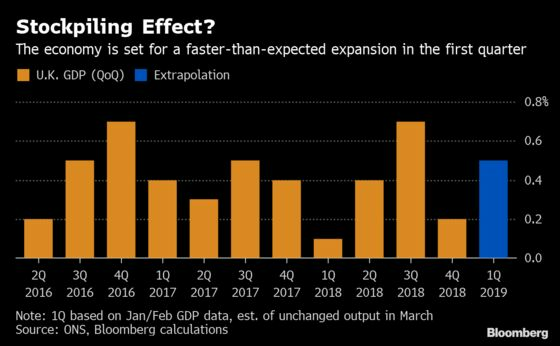 The IMF this week cut its prediction for 2019 to growth of 1.2 percent from 1.5 percent previously, and that’s based on the government securing a deal.